Extremely exciting news out of Yaletown: the highly anticipated opening of Bella Gelateria’s second location overlooking the water on Marinaside Crescent is nearly upon us. The Italian (soon-to-be) hot spot will open its beautiful doors on Friday, August 22nd. Though Bella is known for their internationally renowned gelato, you can expect lots more from this new shop, which will seat up to 80 (40 on the patio, 40 inside). Look forward to pizza Napoletana (made by none other than a pizzaiolo fresh off the plane from Italy) a wine menu featuring unlisted artisan creations from family-owned vineyards, gelatinis (which are martinis made with gelato), fresh house-made pastries for breakfast, and Milano Coffee. 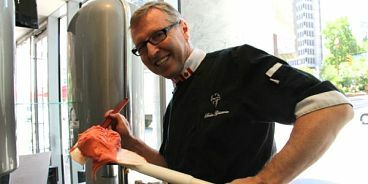 The man behind it all is master gelato maker James Coleridge who’s put millions into renovations. Seventy five thousand hand-painted, mosaic tiles from Italy will lines the walls, and white Italian marble will grace the floors. Bella Yaletown is (very obviously) a new spot you must check-out.